My mom never fails to amaze me. Whenever I call her regarding a recipe, she has all the answers to my questions. Even when I am least expecting it. Agreed that she does not make Chinese or Italian, but Indian cooking is her forte. She is the kind who had her basics very strong and I believe that such people hardly take any time to adapt to any kind of cuisine. Wish I had learnt more Odiya recipe from her during my school/college days. Yesterday when I was feeling a bit down, I was reminded of my childhood days which would never be the same without stuff like arissa pitha, gajaa, nimika, muduku and various types of muaa. Since I had the basics in stock, I decided to prepare some mudhi muaa for myself. While I had seen her preparing 'Muaa' a long time back, I did not remember the steps. So I called her and asked "How many cups 'Mudhi' for 1 cup 'guda'? . As expected, she replied 'seita tote kemiti kahibi. Andaziya kari ne'. Huuh, these ladies are some experts. They use their eyes and hands as some kinda weighing machine while I am totally lost without my measuring spoons and cups. 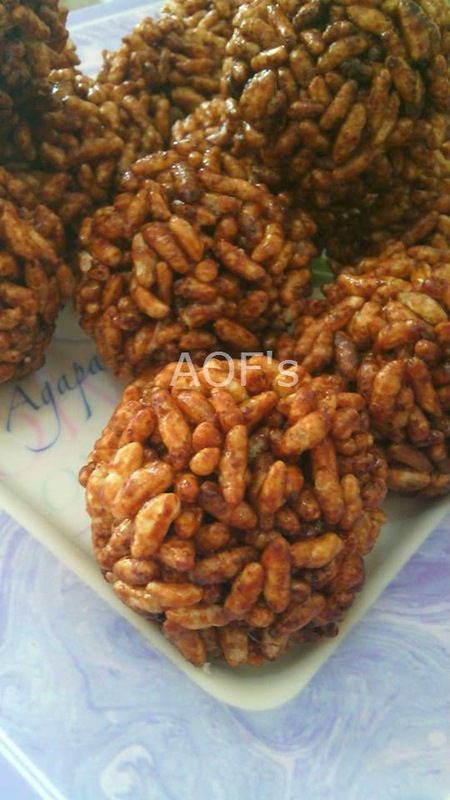 Somehow we decided that 1 part jaggery would be fine for 5-6 parts puffed rice and hence I set about the cooking. By force of habit, I ended up making modifications to the original recipe and used a few other ingredients keeping the sensibilities of my toddler and his friends in mind ( you know how most kids are these days ). Turned out to be easy given her tips and made a nice batch of muaas which are going to get over very soon. Maybe even before this post goes live. Cooking - Heat the jaggery with 1/3 cup water in a wok. It will melt and then start to foam/bubble. Gradually ( arnd 3-4 mins) the bubbles will get smaller and now it is time to test for the right consistency of the jaggery. If it gets over-cooked then the puffed rice will not bind together. Take a large bowl with cold water in it. Put a single drop of the jaggery into it. If it dissolves into the water, it needs to be cooked for longer time. Keep repeating this test at intervals of 1 minute. Add the puffed rice and mix thoroughly to uniformly coat the puffed rice. Remove from the flame at this stage. Immediately add the peanuts, char magaj, walnuts, raisins, grated chocolate and nutmeg. Mix in. Keep aside for 2-3 mins. Rub ghee on your hands and take a fistful of the mixture. Mold into a ball . Repeat for the remaining mixture. Keep aside to cool down for 1-2 hours. One can then store them in an airtight tin for almost a month.